The capacitive keyboard shows how to use capacitive sensing to handle six values at a time. Tapping the keys sends data to a Processing sketch that shows how much you’re pressing on the kays and plays “notes” based on your taps. Requires minimal wiring skill; moderately complex programming. 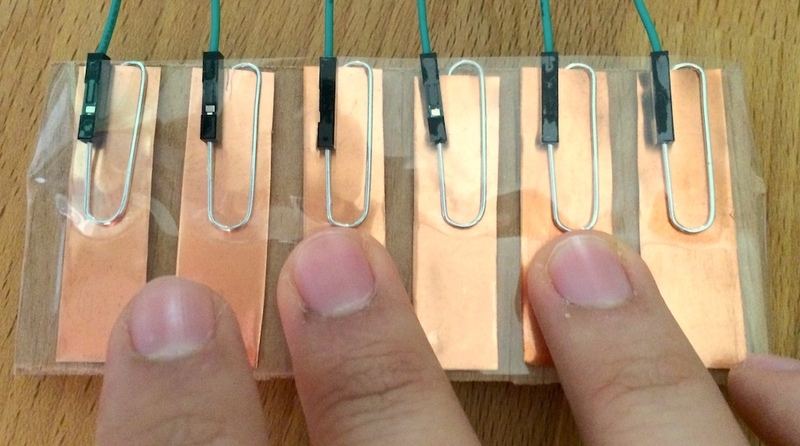 6 paperclips and optionally copper foil to make a more solid terminal. Optional: Plug jumper wires into the ribbon cable and your Arduino as shown in this Adafruit tutorial. Try to match colors if you can; it will make for less (and eaiser) debugging. Download and install the capacitive sensor library. Download and install Processing if you don’t have it. Modify the serialInterface variable to point to the serial port your Arduino is connected on; you can find the port name in the lower right-hand corner of your Arduino IDE window. Change the threshold value to make the keyboard more or less sensitive. Add extra keys to the keyboard, and extra notes to the code.